Above: Madhabi Mukherjee in The Coward. 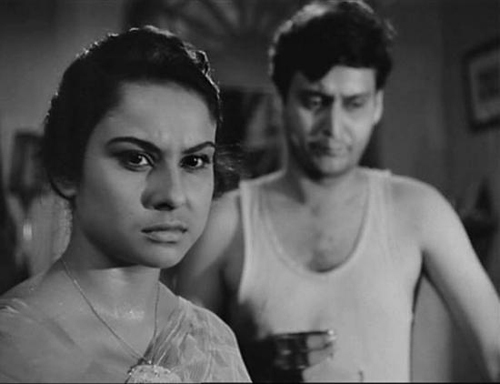 On the surface, Satyajit Ray's diptych, Kapurush-o-Mahapurush (The Coward and The Holy Man) seems an unlikely pairing: one, a stranded screenwriter's encounter with a lost love amidst the remote plantations of Darjeeling; the other, a hapless suitor's attempts to wrest his beloved from the influence of a silver-tongued charlatan. But beyond the presence of a pining lover in Kapurush and Mahapurush, the films are also connected by a sense of cultural paradox, whether between class stratification and democratization, or traditional beliefs and academic knowledge. In Kapurush, Ray explores the crippling nature of classism through a colonial subtext, where the British helped to reinforce archaic notions of privilege by identifying with an entrenched caste system to perpetuate equally rigid models of social hierarchy - even in conducting business - that continue to exist long after the country's independence. Western-educated tea executive, Bimal (Haradhan Bannerjee) is acutely aware of this dichotomy, leading a self-imposed isolated life with his wife, Karuna (Madhabi Mukherjee) in an already isolated community, reluctant to break ingrained mores by socializing with his subordinates and instead, assuages his conscience by drinking heavily. Similarly, the mask behind Karuna's aloofness towards her former lover betrays its fragility when she offers Amitabha (Soumitra Chatterjee) her sleeping pills to help his anxious sleep. In Mahapurush, the panacea comes in the guise of an intriguing holy man, Birinchi Baba (Charuprakash Ghosh) and his animated assistant (Robi Ghosh) who, through a combination of parlor tricks, reconstituted, common sense parables, and outrageous claims (that include commanding the sun to rise and set, and witnessing Gautama Buddha's birth and Jesus Christ's crucifixion), have insinuated themselves into the home of lonely widower, Gurupada Mitter (Prasad Mukherjee), his daughter Buchki (Gitali Roy), and in time, the company of his wealthy friends. As in Kapurush, the reclaiming of a lost love is tied to the dismantling of outmoded values and a willingness to forge one's own destiny. In this sense, both Kapurush and Mahapurush illustrate the problem of perpetuating a culture of dependency (and in particular, a sense of rationalized inaction), even as society moves towards development and modernization (an embrace of scientific progress that is implied in Birinchi's self-serving references to Plato and Albert Einstein). It is this dichotomy that also binds the closing images of Kapurush and Mahapurush into a collective mosaic of Indian society at a cultural crossroads - the light of an approaching night train, the resetting of a fuse box after an induced power outage - both illuminated by a preceding spark: one, returning to the darkness; the other, emerging into the light.